I got a beautiful request a couple of months ago: to illustrate a family in their favourite shared moment, when they all sleep together in their big bed. I suggested adding a night blanket so that the space is not specific… is it a real space? Or are they dreaming? That way I was also able to add a star representing the boy’s twin brother who died soon after birth. The inspiration piece that made this family contact me was my couple snuggling in bed (and I guess you can see that with the perspective and colours), but a different technique was used to allow for a certain warmth given by the hand-drawn look of the lines and their features. This is just beautiful and it’s as if you created this for me and my family. 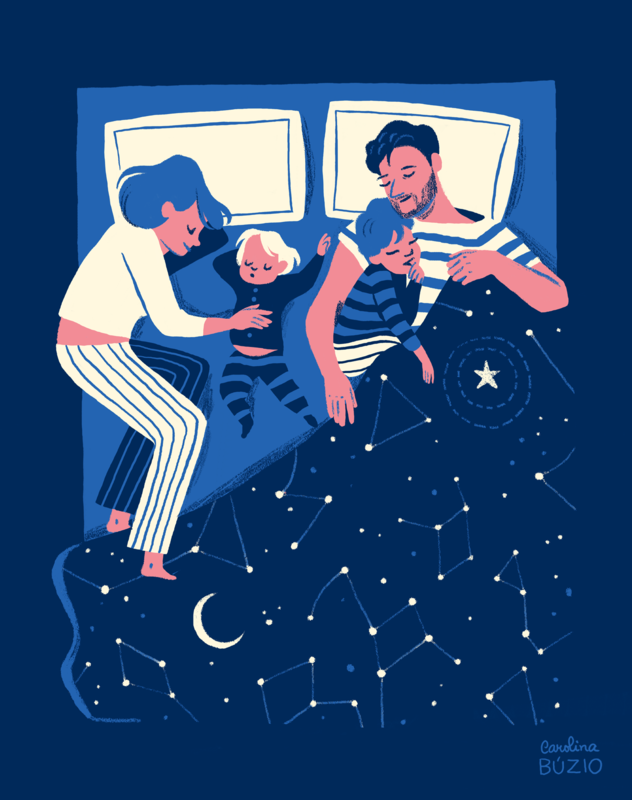 The story behind the illustration is so heartbreaking, but shows such a loving family and a true reflection of what happens when you have kids – they always end up in your bed!. You should sell these, amazing! Hi Gary, Thank you so much for your kind words! As this one was made for and represents a very specific family, I will not be selling these… but later in the year I might be able to take custom orders! I would like this illustration printed on a poster sooooo much! I love your idea and illustration for the family drawing. I’m really interested in a custom piece for my family of your hand. Is this possible, I live in the Netherlands. I hope to hear from you, so we can talk about it.